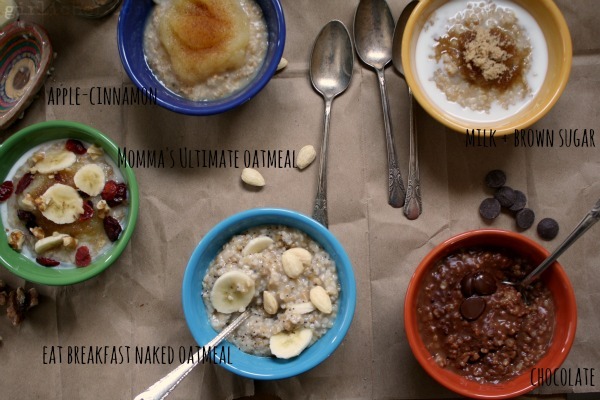 Ultimate Oatmeal, Steel Cut Oats, and a feature at Momma's Meals! Today I'm being featured by the incredibly sweet, proud-to-be-called Momma, Tammi. Tammi blogs about momma-hood, family, and food at Momma's Meals. On Fridays, Tammi loves to give some love to other food and momma bloggers on her Featured Friday series. I'm so honored that she picked me today! And I cannot believe she actually picked TWO things to make from my blog. She's sharing her experience at her place - I hope you'll go over to see what she made and say HELLO! Aaaaaand, since she's making something from my blog, I decided to make something from hers, as well. I'll be making Steel Cut Oatmeal with a couple of variations, including her version that inspired me today, Momma's Ultimate Oatmeal. I grew up eating oatmeal. I've always liked it. Though, I openly admit, that as a kid, it was those little individual packages that I tore open and then poured boiling water over. Mmm hmm - instant oatmeal. Apple Cinnamon was my favorite. But hey, at least I ate my oatmeal... I can't get my kids to touch the stuff! I've tried everything. All varieties (even the instant). I'll keep trying to convince them, but fortunately my husband needs no convincing, so I can make a big pot and be assured that it will not go to waste. I think the first time I tried Steel Cut Oats was about 13 or 14 years ago. 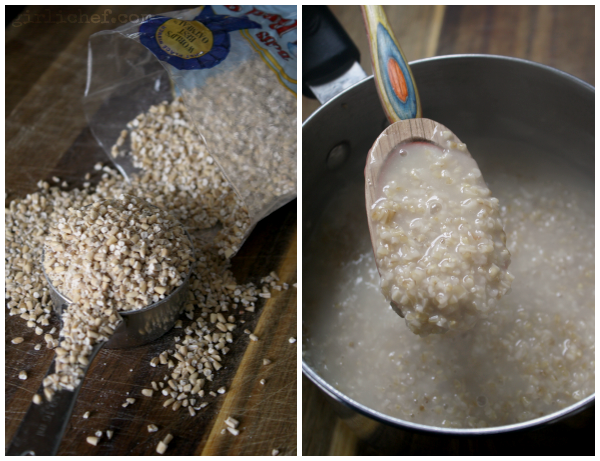 Also known as Pinhead Oats or Irish Oats, they're meaty texture became my fast favorite. It doesn't take much more time to make than it does a pot of regular oats, but somehow, it seems so much more satisfying. I usually buy this variety of Bob's Red Mill, it's available pretty much everywhere around here (but I know they have quick-cooking and organic options, as well). And they're delicious. The recipe I use to make a basic batch is just the one from the back of their bag. Place everything into a pot and bring to a boil. Reduce heat to a low simmer; cover and cook for 10-20 minutes (al dente - creamy), stirring from time to time. Remove from heat and let stand for a couple of minutes. The only hard part is deciding what you want to put in to your oatmeal (unless you're a purist and like it as-is...I've never actually met anybody like that, though). I have two personal favorites - the basic milk + brown sugar combination and what I like to affectionately call "eat breakfast naked oatmeal". I have to say, though...after trying Momma's Ultimate Oatmeal add-ins, I was smitten. Occasionally I'll add chocolate. Apple-Cinnamon is always good (whether you use applesauce or sauteed apples). Occasionally I'll add ripe berries and honey. Other times orange zest, pecans, and maple syrup. Peaches and a good drizzle of heavy cream with raw sugar. Dried fruit is always good. 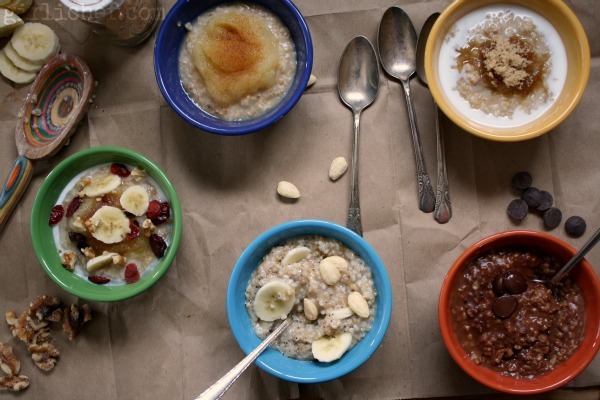 How 'bout you... what are your favorite oatmeal add-ins? Do you prefer steel cut, rolled, or instant oats?